Ez-Adjustable Lanyards: Flexable Length Lanyards With Belt or Hat Straps Style of Lanyard Clasps. Good For Flexible and Adjustable Length of Lanyards. EZ-Adjust lanyard is a lanyard with the function of adjusting the length of lanyards easily. Ez-Adjustable lanyards come with belt or hat straps style of metal clasps for adjusting the length of straps or webbing. The Ez-Adjustable lanyards' metal clasps can be flipped up to open and flipped down to close. Because most lanyards on the market have a fixed length, they do not fit everyone due to each individual's different height. The Ez-Adjustable lanyards come with state-of-the-art design with the capability to shorten the existing length of lanyards without hassle. Standard Ez-Adjustable lanyards are available in heavy duty nickel color swivel hooks, badge clips, key rings, or cell phone connectors at the same cost. They can be worn as neck lanyards, wrist lanyards, used as dog leashes, or used as shoulder straps for handbags, bags, or purses. Ez-Adjustable lanyards also come with a variety of optional hardware attachments, such as safety break-away buckles, heavy duty nickel color, gold, antique brass or black nickel color snap hooks. The Ez-Adjustable lanyards with the cell phone attachment can be used to carry a camera, cellular phone, USB flash memory cards, CD, iPod or MP3 players, flash lights, keychains, small tools, small meters, ID name badges, electronic devices, etc. Ez-Adjustable lanyards are available as plain and non-imprinted lanyards, pre-printed lanyards, or custom logo imprinted lanyards. Please check our online catalogs for more Ez-Adjustable lanyards. Specifications: Ez-Adjustable Lanyards: Variable Length Lanyards With Belt or Hat Straps Style of Lanyard Clasps - Lanyards Supplies. 1. Standard Width of Ez-Adjustable Lanyards: 5/8". 4. Standard Colors of Webbing/Straps: black, royal blue, navy blue, white, red, yellow, orange, grey, burgundy, dark green, light green, purple and teal colors. Optional: Any Pantone PMS colors with a minimum order of 5000 pieces or more. 7. Plain, Blank, Non-Imprinted Models: Available in black, red and royal blue color with any custom length - in stock can be shipped right away. Available in red color webbing with "VISITOR" printed (silk screen imprinted ). 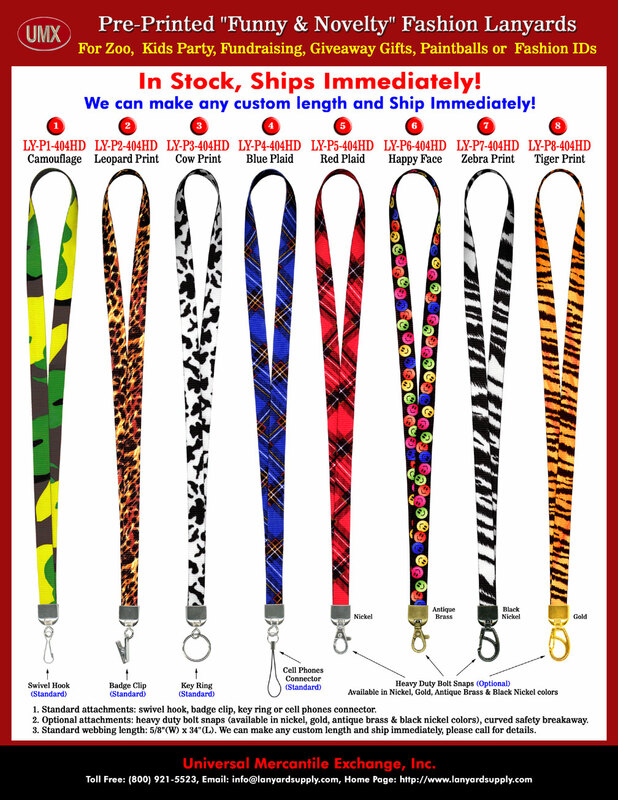 Dye-Sublimated Multi-Color Pattern Lanyards: Camouflage, Leopard Print, Cow Print, Scottish Blue Plaid, Red Plaid, Happy Face, Zebra Print, Tiger Print, Sun Flower Print, Hawaii Theme Print and more, please check our online lanyard catalogs for more information. 9. Custom Imprinting: Any custom printed, customized or personalized logo printed lanyards available by silk screen imprinting. 10. Applications: Any neck lanyards or wrist lanyards. For ID name badges, dog leashes, as shoulder straps for handbags, bags, or purses. Can be used to carry camera, cellular phone, USB flash cards, USB flash drives, CD, iPod or MP3 players, flash lights, keychains, small tools, small meters, electronic devices and more. 11. Minimum Order: 2 Pieces/Per Color, Per Style. Small Minimum Order: Good for Personal Use or for Small Business ID Name Badge Holders. You are viewing > Lanyards > Ez-Adjustable Neck Wear Models > EZ-Adjust Lanyard: Variable Length Lanyard With Belt or Hat Strap Style of Lanyard Clasp Supply.